... to our Website; our Community; and our Council. This is the official website of Penrice Community Council. It is being maintained by local people for local people. The purpose of the website is to meet the Council's legal obligations to publish specific information online and also to share other information which could be of interest to local people. 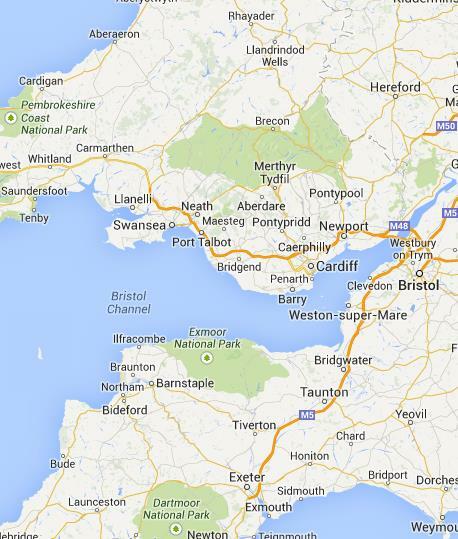 Our community is in South Wales, on the south coast of the Gower Pensinsula near the city of Swansea, and includes the villages of Horton, Oxwich, Oxwich Green, Penrice, Slade and Little Reynoldston. The Gower Peninsula was the first area of Britain to be designated an AONB - an Area of Outstanding Natural Beauty - and the south coast faces North Devon over the Bristol Channel. This has always been a farming area and farming is still the main land use. 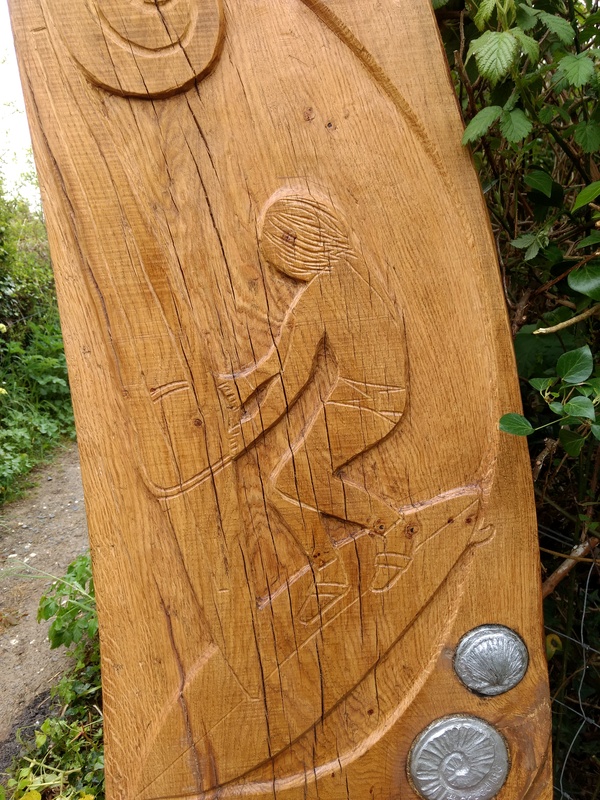 However, some land has been diverted to holiday and chalet parks and there is also holiday accommodation within the villages so that tourism is significant locally and to Swansea. Residents and visitors enjoy the varied landscapes and seascapes, and walking and recreation on the beaches and bays is popular. 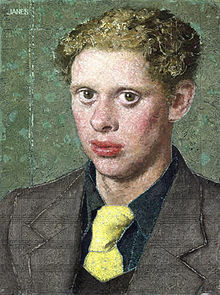 The Community Council is named after Penrice for historic reasons. Penrice was the local feudal manor and Horton was a sub-manor. 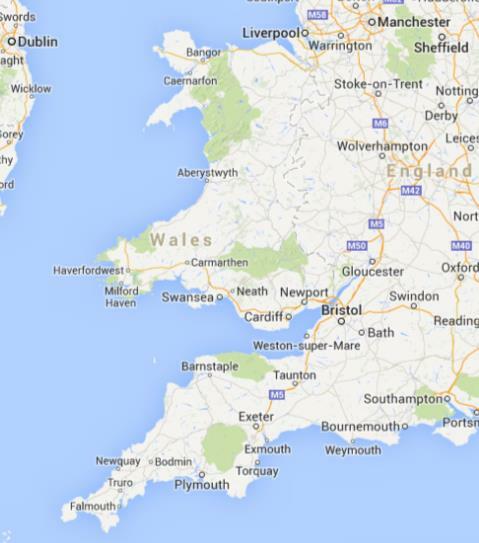 Now Horton and Oxwich are the larger settlements. 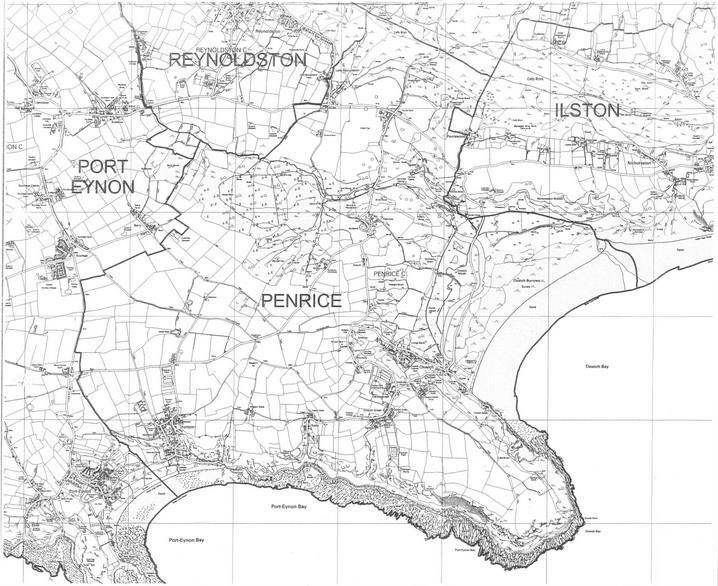 Penrice Community Council is one of 24 community councils covered by the City & County of Swansea. The Community Council consists of nine unpaid volunteers who work with a part-time clerk on behalf of just over 400 electors. The Council is funded from a small precept collected with the Council Tax and is governed by strict guidelines. The Community Council holds ordinary meetings most months, with the venue alternating between Oxwich and Horton. Occasionally, additional meetings are necessary. All meetings are publicised and are run in a formal manner. They are open to the public and there are some opportunities for members of the public to speak. Local people are encouraged to share information and express their views outside meetings either by contacting local councillors directly or through the clerk on behalf of the Council. The Community Council can become involved in any matter which affects the local community. 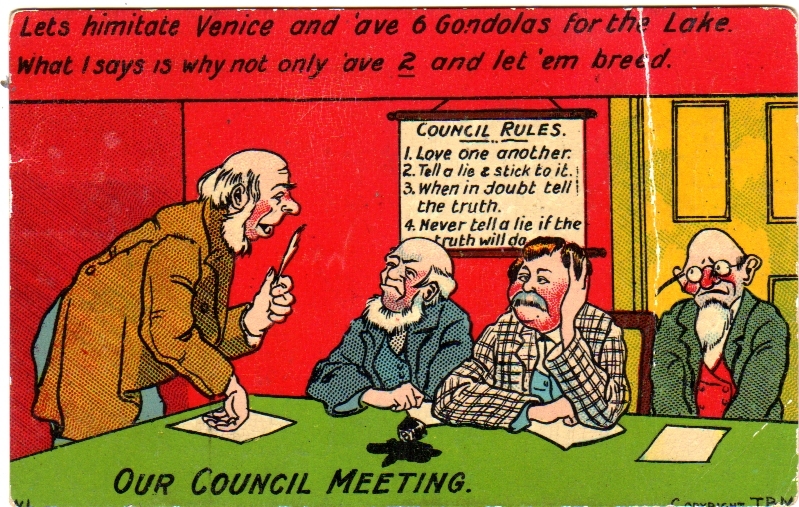 The Community Council can determine specific matters. It owns Greens in Horton and Oxwich Green and has provided notice boards and seats in several locations. 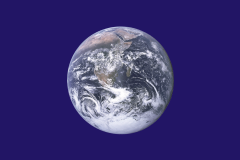 It can provide funds to local organisations and for specific events. 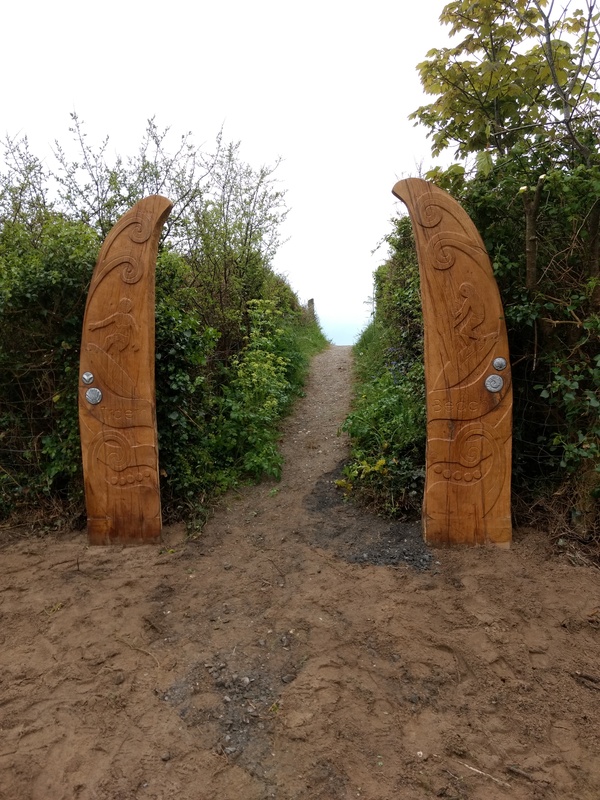 It has traditionally given support to the halls in Oxwich and Horton, and also to the churches of St. Illtyd's (Oxwich) and St. Andrew’s (Penrice) and the Methodist Chapel (Horton) to contribute to the upkeep of buildings or for specific equipment. 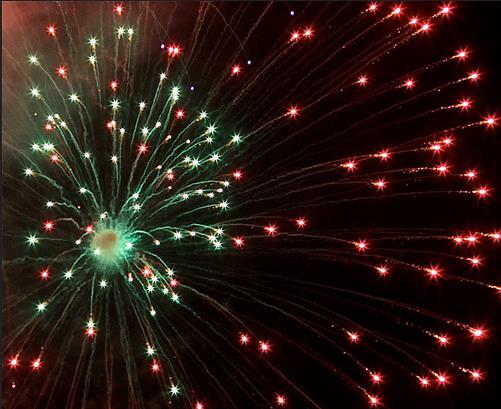 It helps fund annual children's parties in the two halls as well as an impressive annual fireworks display on Horton Green. The Council may make representations in response to consultations - this includes providing a local response to planning applications and on wider issues such as sand dredging. Councillors take the initiative when they observe or are advised that there is something of local concern. Examples have included dangerous steps on public land and problem styles on footpaths. 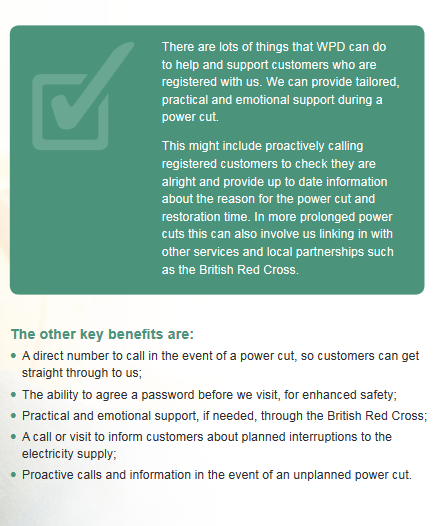 The Council has an obligation to make some information available to the local community by public notice and online. This website is the latest development in meeting that obligation and in sharing additional information with the community. The PCC holds a meeting in most months at one of the local halls. See meetings page and PCC noticeboards for confirmation and agenda. National Trading Standards in partnership with law enforcement, other organisations and businesses (such as Royal Mail) are seeking to raise awareness of scams and how you can deal with them. See Friends Against Scams. 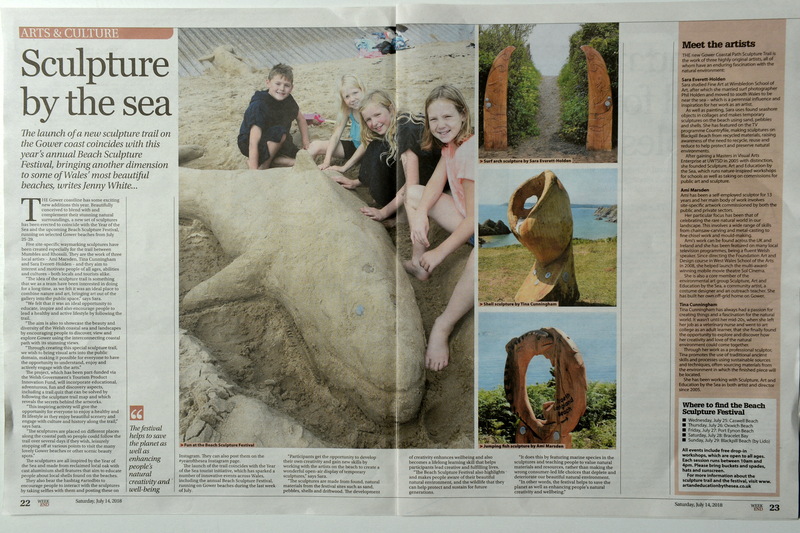 Join free artist-led workshops to create temporary open air sculptures from beach-found materials. 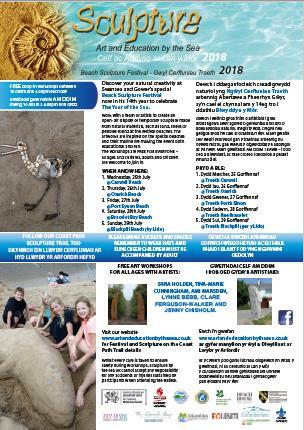 Local beaches, including Port Eynon on the 27th July 2018. See also Art & Education by the Sea Website for more details. 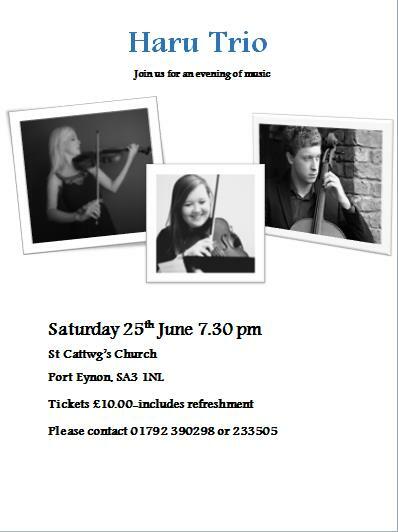 A concert of local musicians performing at St Cattwg’s Church on Sunday 24th June in support of Asylum Justice and the Welsh Refugee Council Hardship Fund with a glass of wine in the interval. Donations please. The popular gardens of Box Boat Cottage, 6 The Boarlands, Westcliffe House and the Bays Farm open their gates again for the enjoyment of visitors and to raise funds for charity. Combined admission £4.50 with children free. ‘Swansea: The Caput of the Lordship of Gower before Industry’ at St Andrews, Penrice, with refreshments after the talk. £8 on the door. A festival taster at Gower Inn Parkmill on Friday evening followed by 2 full days at the Gower Heritage Centre. One of Wales' biggest events returns to Swansea Bay. Beautiful music at beautiful venues. Tickets are now on sale. Open Air Theatre at Oystermouth Castle - it could be enchanting. The Summer Concert in the Marquee at the Gower Showground, Penrice Park, will be on Friday 3rd August 2018 just ahead of the Gower Show. Tickets £15. These will be available at the Penrice Lecture on the 26th or ask for contact details to obtain locally. 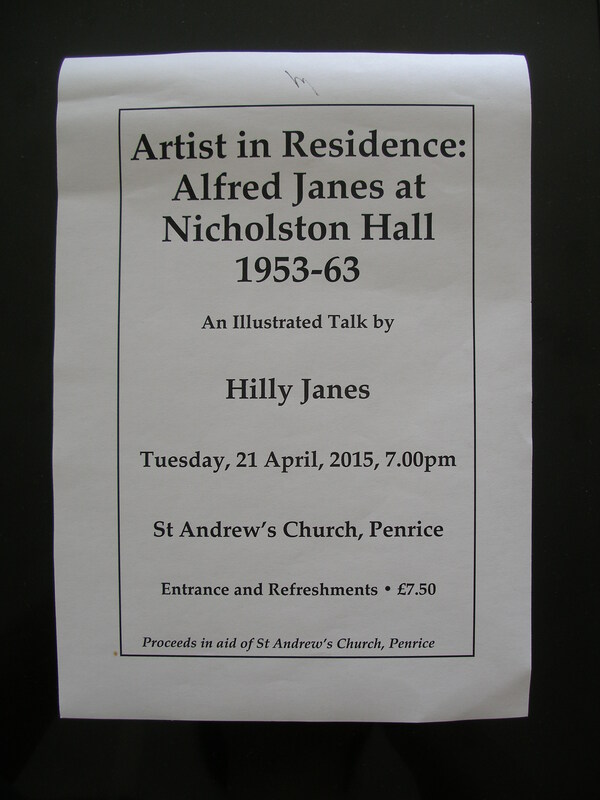 Proceeds to St. Andrew’s Church, Penrice. Another full programme of events at Penrice Castle Park. 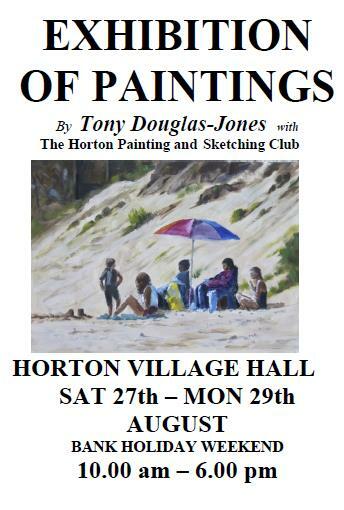 Tony Douglas-Jones with the Horton Painting & Sketching Club return for the Bank Holiday at Horton Village Hall and share their art works. Register now so that you can continue ordering repeat prescriptions online from your doctors. A new countrywide service is replacing the existing local service. See Gower Medical Practice for more details. There have been break-ins to local garden sheds. 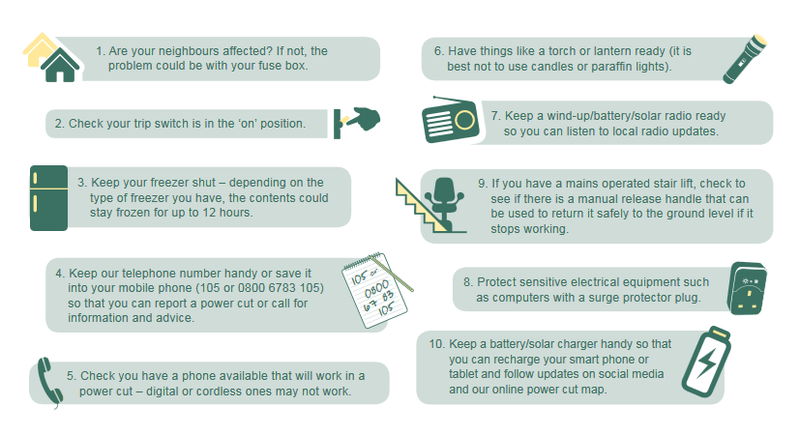 See our Security page for Home Security advice. Penrice Community Council meets most months. See Meetings for details. Defibrillator, Resuscitation & Related First Aid Training is provided locally. 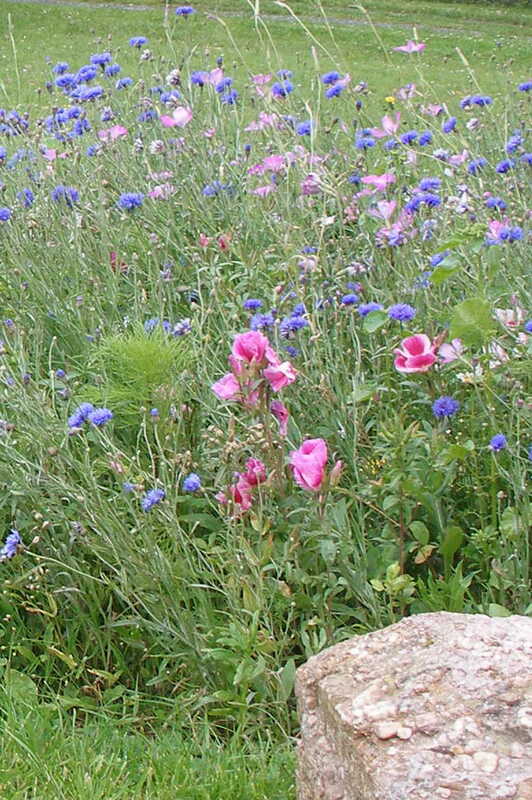 Wildflowers have been planted locally by Swansea, the PCC and local residents. 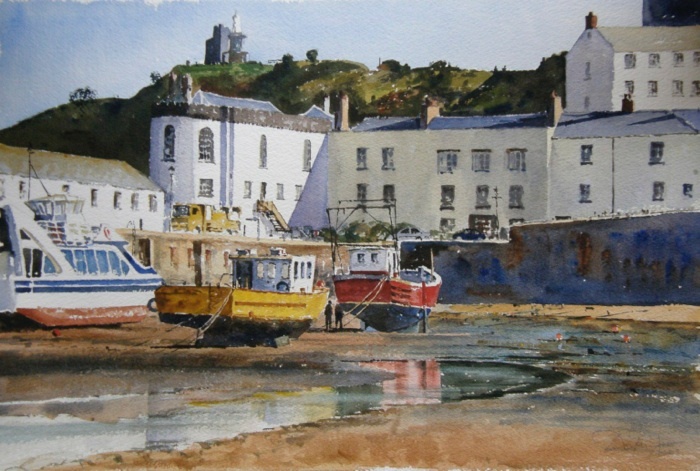 Horton Village Hall, Oxwich & Penrice Community Hall, St Andrews (Penrice), St Illtyd's (Oxwich), Horton Gardening Club, Horton Painting & Sketching Club and the local RNLI hold regular activities including talks, concerts and other entertainments. Similar organisations in neighbouring villages also hold a variety of events. 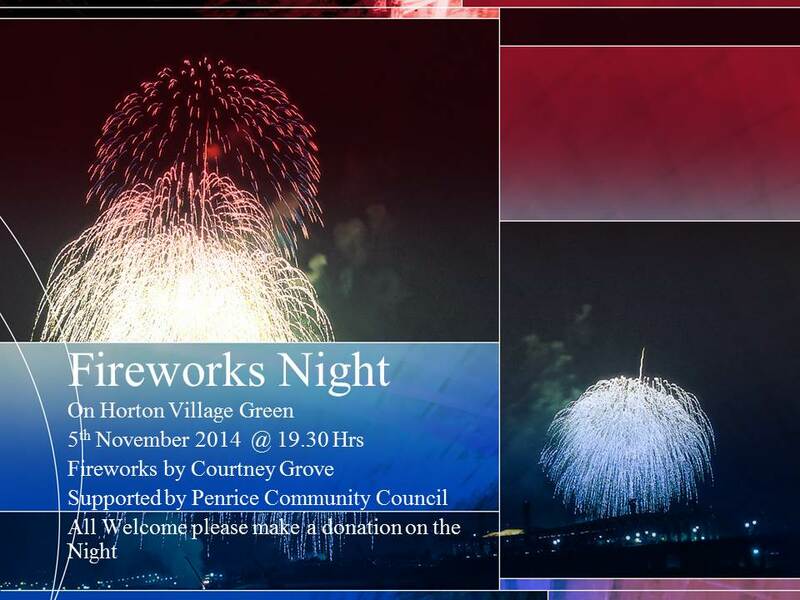 Horton Fireworks are held on Horton Green on Bonfire Night or the next night on which conditions are suitable. The Gower Show is held once a year in Penrice Castle Park. There is usually a scheduled monthly meeting of the PCC at 7:30 pm on the 3rd Wednesday of the month (exclding August) at one of the local halls. See Meetings for details. 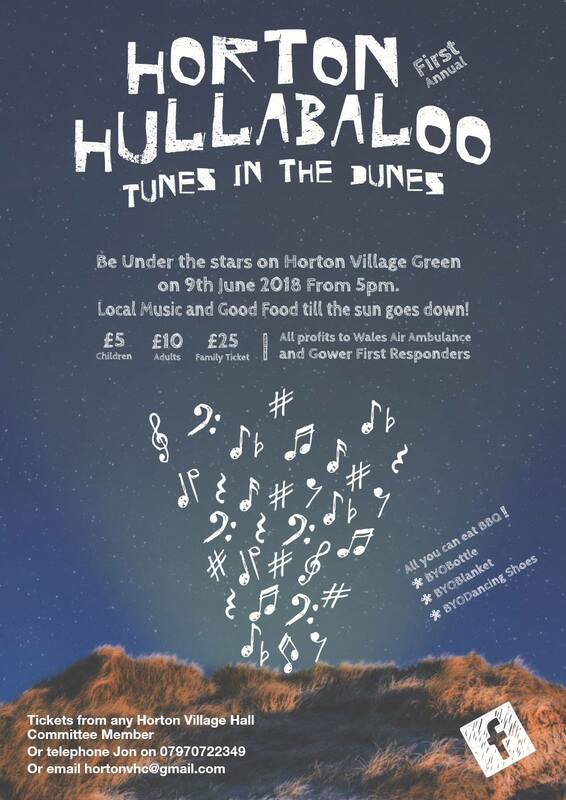 Family-friendly evening of music with bbq & bar on Horton Green. Saturday 9th June 5pm-11pm. Tickets available in advance. See poster for details. Call in to a drop in session on Thursday 24th May - at the Community Hall in Oxwich (10:00 til 12:00), or Horton Hall (14:00 til 16:00) - or complete a form and return to a designated Community Councillor by hand or by scanning. Please get in touch for further contact details if required. Owls in Gower with Dr Dan Forman of Swansea University Department of Biosciences, 7pm Tuesday 22nd May 2018. St Andrew's Church. £8.00 on the door, includes wine and refreshments. The Beach signs are now in place on Horton Green. Lisa Kwei Band & Friends present an evening of Fleetwood Mac in aid of Parkinson's UK. 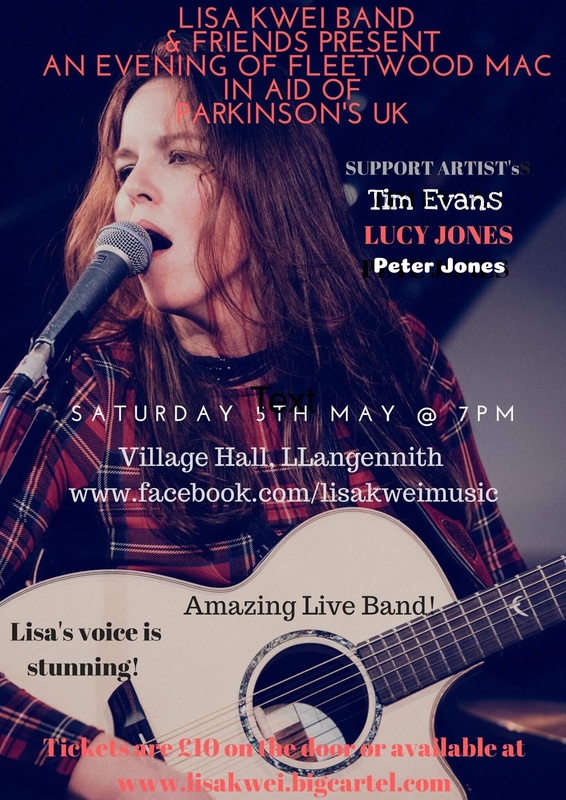 Saturday 5th May 2018 7pm at Llangennith Village Hall. £10 at door. Full bar onsite. The 22nd April 2018 is the focus of celebrations and environmental actions which will take place throughout the year. An important objective this year is the reduction of plastic waste. 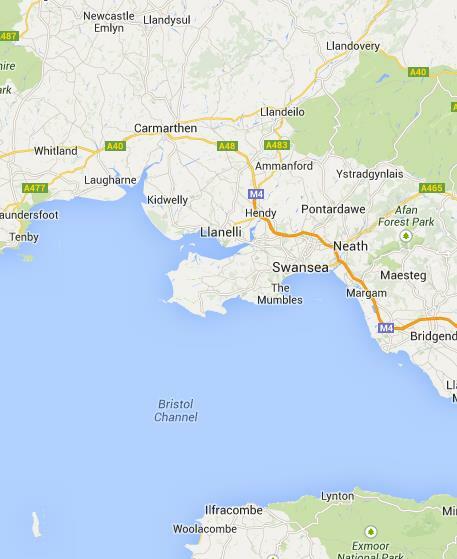 Locally volunteers will be carrying out litter picks along the coast of Gower. Discovering Gower: Lost Caves and Landscapes with John Cooper 7pm Tuesday 24th April 2018. St Andrew's Church. £8.00 on the door, includes wine and refreshments. Alfred Parkman in Gower with Ronald Austin. 7pm Tuesday 12th September 2017. St Andrew's Church. £7.50 on the door, includes wine and refreshments. 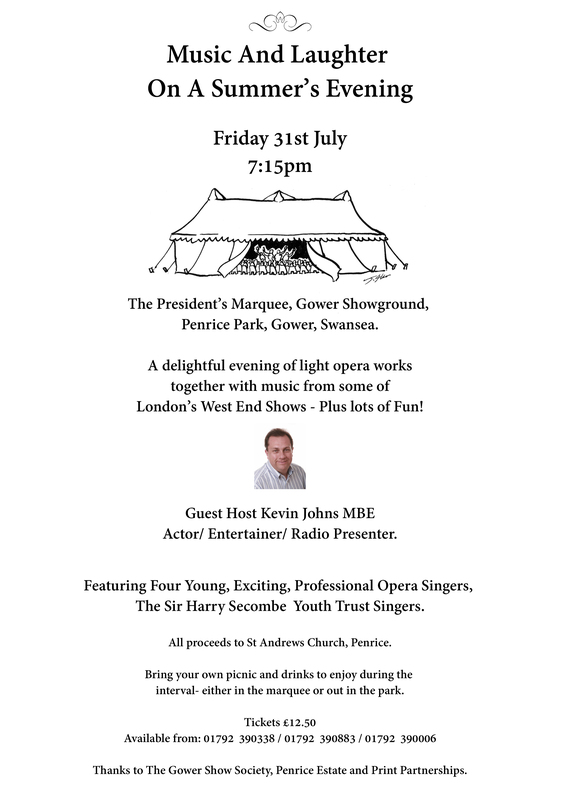 Concert in aid of St Andrew's Church in the President’s Marquee, Gower Showground, Penrice, on Friday 4th August. Details to be confirmed. 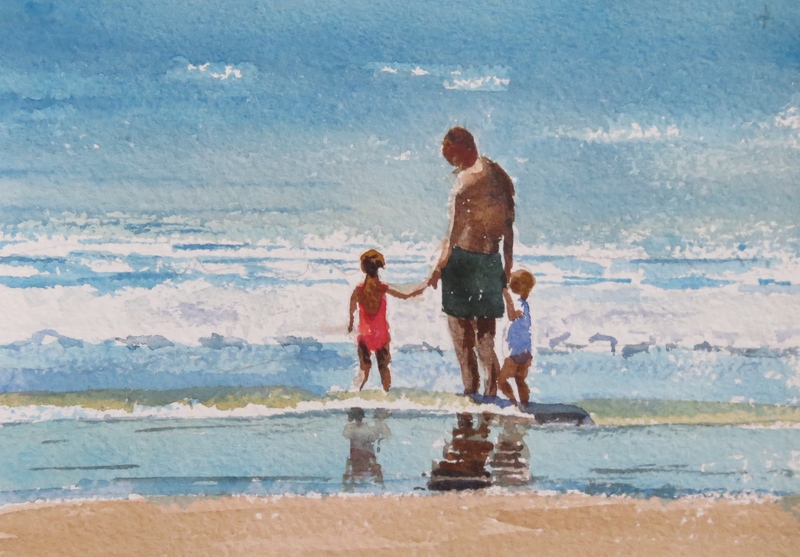 Gower’s Lost Lanes with Richard Daugherty. 7 pm Tuesday 20th June 2017. St Andrew's Church. £7.50 on the door, includes wine and refreshments. Mosses and Lichen in Gower with Barry Stewart. 7pm Tuesday 23rd May 2017. St Andrew's Church. £7.50 on the door, includes wine and refreshments. 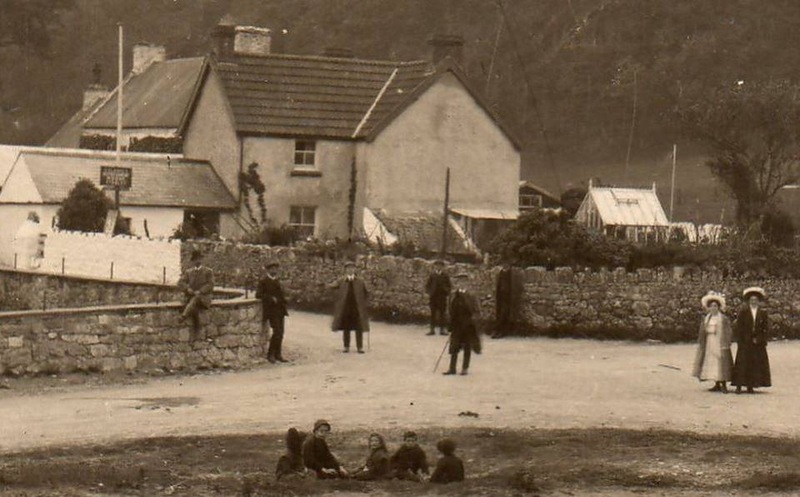 The story of William Crach - Murder in Gower with Andrew Dulley, Assistant County Archivist. 7pm Tuesday 25th April 2017. St Andrew's Church. £7.50 on the door, includes wine and refreshments. The AGM of Horton Village Hall was held on the evening of Wednesday 15th March 2017 at the hall. Halloween Week at Gower Heritage Centre starting Friday 28th. See Gower Heritage Centre for spooky & fun activities. Harvest Supper at Oxwich & Penrice Community Hall Friday 28th October 2016. 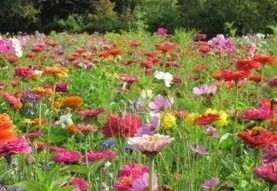 Plant Hunters, a talk by Neil Barry at the November meeting of Horton Hall Gardening Club. Thursday 3rd November at 7pm. All welcome. Fantastic Fireworks at Horton Green. Saturday 5th November 2016 at 7pm. Contributions to Courtney Grove. Do follow Bonfire Rules. Build up not out. No matresses or the like. Nails, etc, okay as will be properly cleared away. Cake Sale & Coffee Afternoon in aid of Ty Hafan. Rhossili Village Hall Sunday 6th 2pm - 4pm. Donation of cakes gratefully received. Tickets £7 from Reynoldston Village Shop/Post Office. The Severn Bridge at 50: A High Wire Act - behind the scenes at the original bridge as well as some nostalgic home movies of the old car ferries. On BBC iPlayer into first week November 2016. Coast: The Great Guide Episode 2 Southern Wales - including Gower. Remembering Aberfan 50 years on. The disaster and its aftermath are remembered in documentaries, film poem and concert. On BBC iPlayer into November 2016. The next scheduled monthly meeting is at 7:30 pm on Wednesday 19th October 2016 at Horton Village Hall. See Meetings for confirmation and agenda. 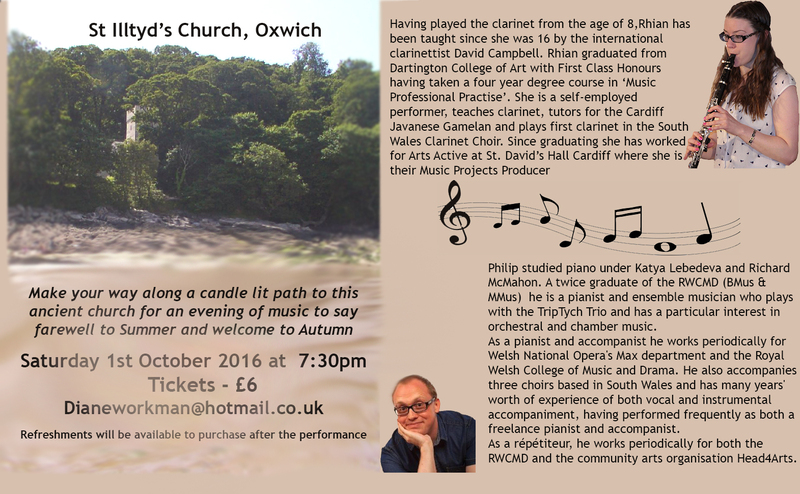 An Evening of Music with Clarinet & Piano at St Illtyd’s Church, Oxwich. Saturday 1st October 2016 7:30pm. £6. The story of World War II American GIs in Gower & Swansea - a talk at Horton Village Hall. Wednesday 5th October 2016 7pm. Cakes & Refreshments. £3. BBC Question Time will be filmed at Gwyn Hall, Neath, on Thursday 6th October 2016, for broadcast that night. Gower Cider Festival at Gower Heritage Centre: tasting, stalls & live music, childrens' crafts & activities. Saturday 8th & Sunday 9th October 2016 10am to 8pm. Oxwich Strictly Night with music all evening and some dance instructions from local professional dancers. Shepherds Pie supper. Saturday 15th October 2016 7pm. £12, Children £6. Harvest Supper at Horton Village Hall. Saturday 15th October 2016 7pm. £12.50. The next scheduled monthly meeting is at 7:30 pm on Wednesday 21st September 2016 at Oxwich & Penrice Hall. See Meetings for confirmation and agenda. Talk by Dan Forman followed by refreshments. Bank Holiday Weekend: Saturday 27th to Monday 29th August 2016 10am - 6pm at Horton Village Hall. The RNLI will be holding an Open Day at the newly extended Lifeboat House in Horton on 13th August 2016 between 10am and 3pm. Hog Roast and other refreshments. A mini-market is being held for the benefit of Horton Methodist Chapel at Horton Village Hall on Thursday 4th August 2016 starting at 7:30pm. 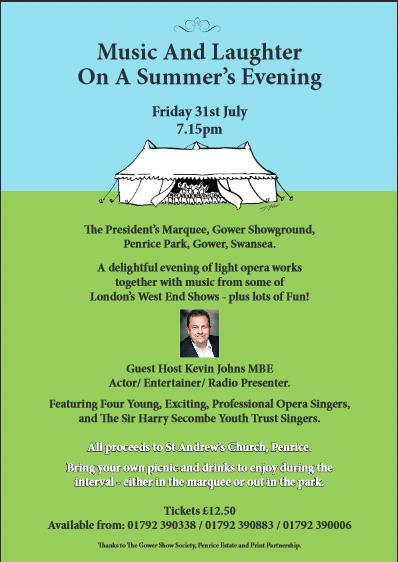 A Summer Evening of Music is being held in the President's Marquee, Gower Showground, Penrice Park on Friday 5th August 2016 to benefit St Andrews Church, Penrice. Kevin Johns MBE hosts with a programme of talented local singers: young opera singers from Cardiff, the Harry Secombe Youth Trust Singers and Cor Meibion Onllwyn. Bring a Picnic to enjoy during the interval outside or inside at your table. Tickets £13.50 per person are available on 390338, 390883, and 390006. The next scheduled monthly meeting is at 7:30 pm on Wednesday 20th July 2016 at Horton Village Hall. See Meetings for confirmation and agenda. 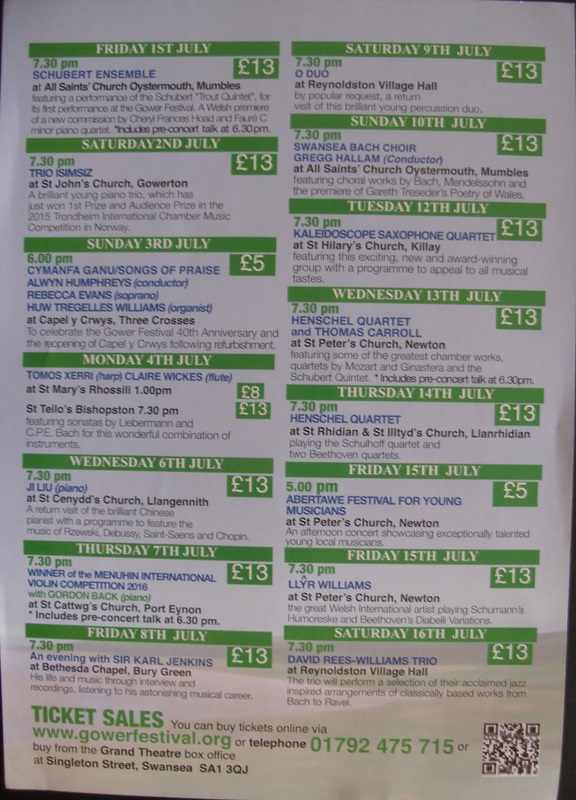 The thriving Gower Festival brings outstanding classical music performances of great variety to the churches and halls of Gower. 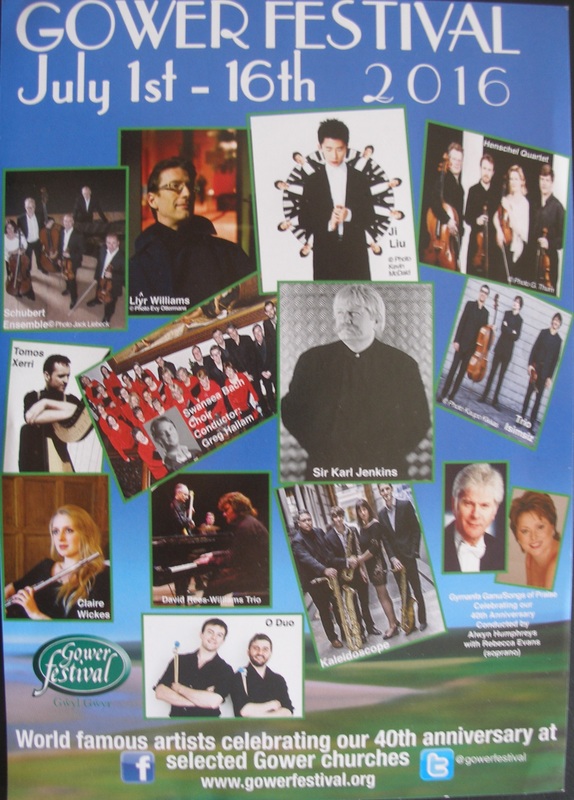 See Gower Festival for full details and the events list for a quick view of the schedule and ticket availability. The award winning gardens of Llanmadoc and Cheriton will be open on to visitors on Sunday 3rd July bewteen 11am and 6pm. Talk by Thomas Methuen-Campbell followed by refreshments. Haru Trio Concert Poster and Haru Trio Concert Programme for details. The next scheduled monthly meeting is at 7:30 pm on Wednesday 15th June 2016 at Oxwich & Penrice Community Hall. 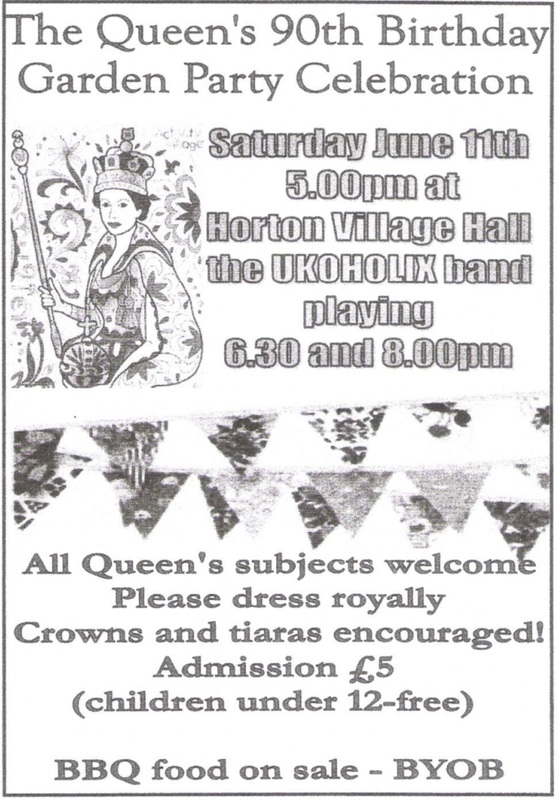 Horton Village Hall at 5 pm Saturday 11th June 2016. Live music from UKOHOLIX at 6:30 and 8:00 pm. Full details on the flyer. Second in 2016 Series of Penrice Lectures. Talk by David Howell followed by refreshments. The AGM and next scheduled monthly meeting are at 7:00 pm and 7:30 pm respectively on Wednesday 25th May 2016 at Horton Village Hall. 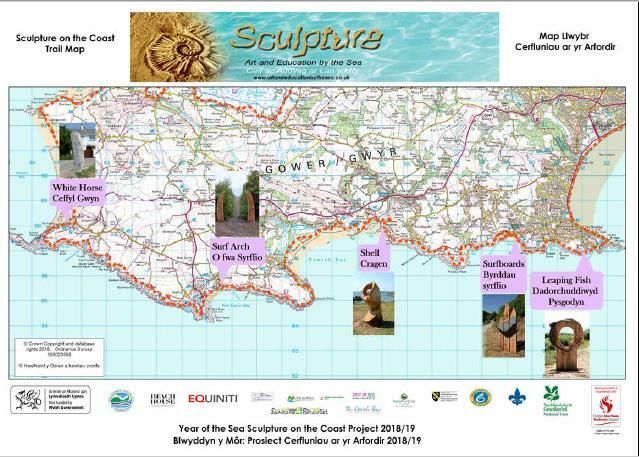 Monday 30th May 2016, 10:00am at Horton & Port Eynon Lifeboat Station. Tea/coffee and hot welshcakes. Monday 30th May (11:00am -8:00pm) and on Tuesday 31st May (10:00am - 8:00pm). Admission is free. 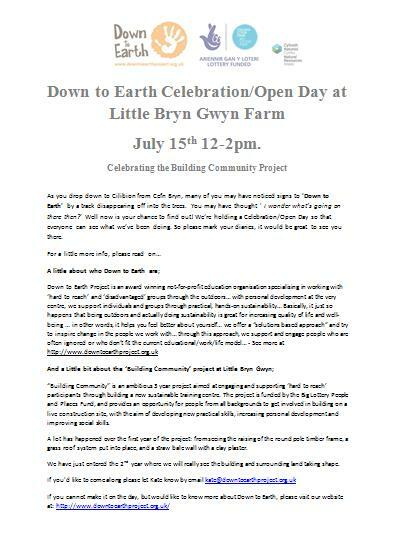 Donations to Ty Hafan are invited. Gardening Club trip to the show on Friday 6th May 2016 with coach from Horton. All welcome. The next scheduled meeting is 7:30 pm on Wednesday 20th April 2016 at Oxwich & Penrice Community Hall. Talk by Mike and Dave Tonge followed by refreshments. The main works are complete but see Infrastructure for plans in April 2016. A talk on pollination by Carrie Thomas at Horton Gardening Club - Horton Village Hall at 7 pm on Wednesday the 6th April 2016 - has been deferred - new details will follow. Tea Party 3:00 to 5:00 pm on Saturday 26th March to raise funds for St Illtyd's Church, Oxwich. Family afternoon tea 3:00 to 5:00 pm on Monday 28th March 2016. Children's Easter Bonnet Parade & also Easter Egg Hunt. All villagers welcome. No charge but please advise number of children attending. Friday 18th March 2016 at 7:30 pm at Horton Village Hall. Book tickets in advance: £10. The next scheduled meeting is 7:30 pm on Wednesday 16th March 2016. Please note it will be at Oxwich & Penrice Community Hall. All villagers welcome. Refreshments provided. The next scheduled meeting has been brought forward to Wednesday 10th February 2016 at 7:30 pm at Oxwich & Penrice Community Hall. The next scheduled meeting is 7:30 pm on Wednesday 20th January 2016 at Horton Village Hall. A meeting will be held in Reynoldston Village Hall on Monday 14th December from 7.45pm to share progress and the proposed share offer. The share offer will be open from 14th December 2015 to 11th January 2016. 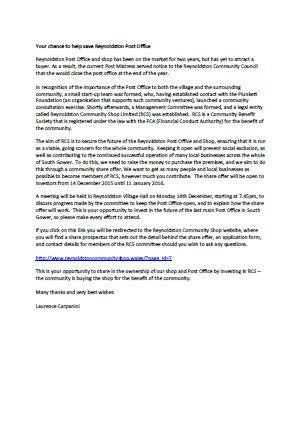 See Reynoldston Community Shop & Post Office Website. The next scheduled meeting is 7:30 pm on Wednesday 16th December 2015 at Oxwich & Penrice Community Hall. A talk organised by Horton Gardening Club at Horton Village Hall at 7 pm on Wednesday the 2nd December 2015. 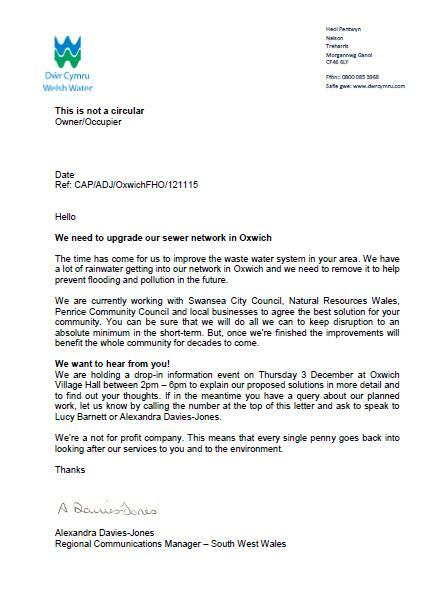 Welsh Water will be sharing their plans and inviting your feedback at an open event to be held at the Oxwich & Penrice Community Hall between 2 pm and 6 pm on Thursday the 3rd December 2015. Make sure you are on the PCC email list so we can keep you informed. West Cross Air Cadets Event at Northwood, Horton, between 12:00 and 3:00 on 21st November 2015, to help fund educational trips and activities. Tickets £10 from Richard & Angela Lewis on 390368. There will be a crime reduction and general safety event between 11am and 2pm on Saturday 21st November 2015 at Reynoldston Fire Station where the Gower Police Station is now located. Local police, fire service and the NFU will all be available. 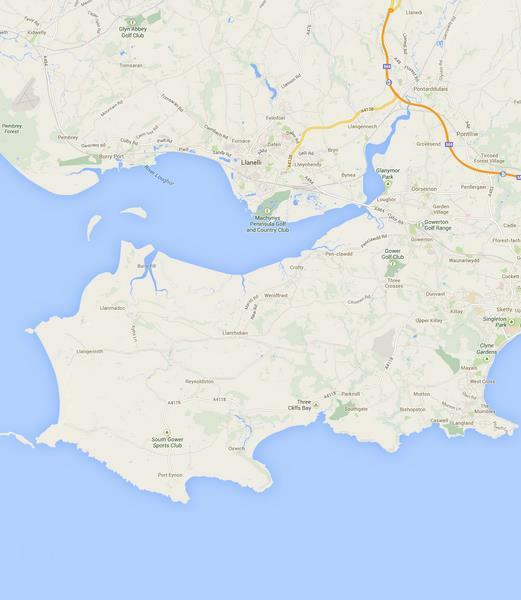 An extra-ordinary meeting was held on Monday 2nd November 2015 at Oxwich. There will be no separate monthly meeting in November. See Meetings for December's scheduled date. At Oxwich & Penrice Community Hall on November 14th 2015. Fantastic display on Horton Green. 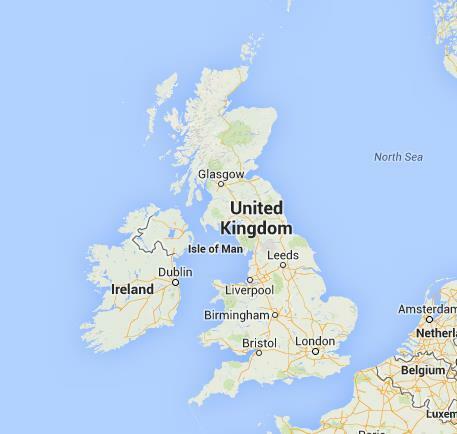 Now 7pm Friday 6th November 2015. If you haven't received an update make sure you are on the PCC email list. 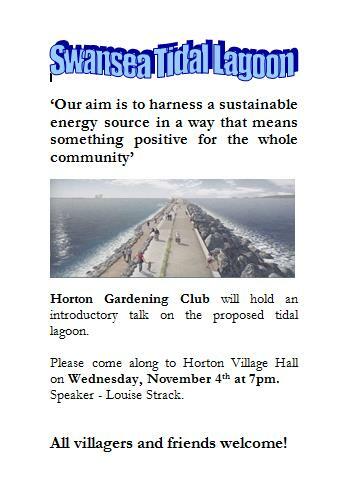 An introductory talk organised by the Horton Gardening Club at Horton Village Hall, at 7pm on Wednesday 4th November 2015. 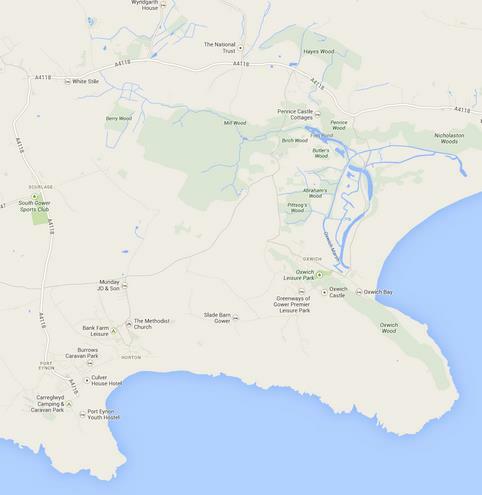 Monday 2nd November 2015 at 6pm, Oxwich & Penrice Community Hall Village Hall to progress the transfer of land to the RNLI. 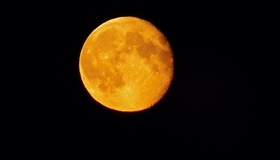 The full-looking bright moon could be visible between 27th & 28th September 2015 depending on weather conditions. 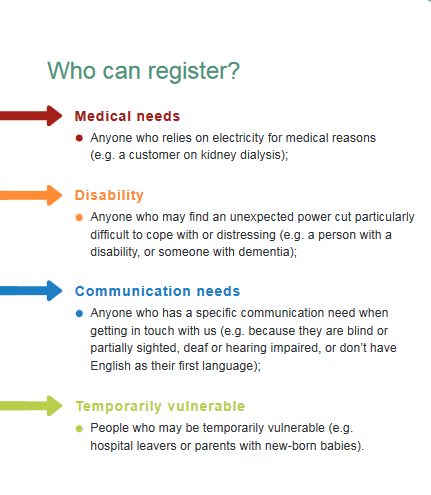 Registration from evening of 25th September 2015. Event on 26th September 2015. Races start in Port Eynon with the Swim in Port Eynon Bay. 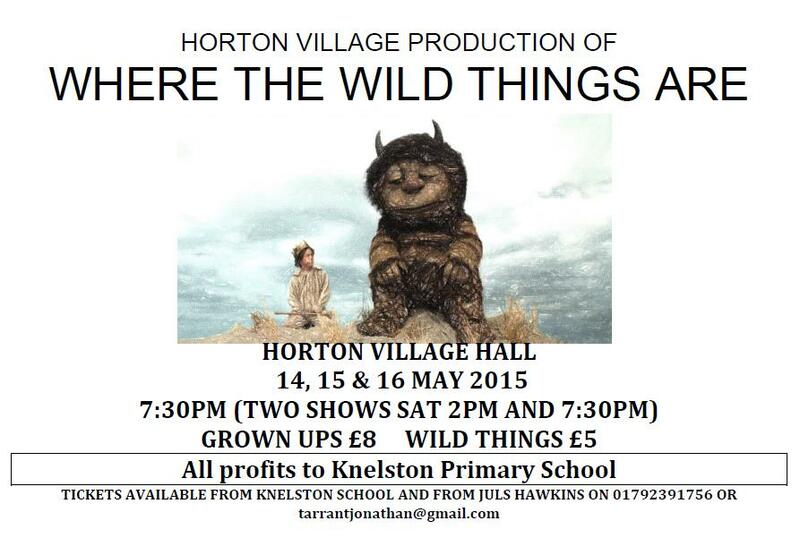 The Run takes in Horton. The Ride loops around Fairwood Common. 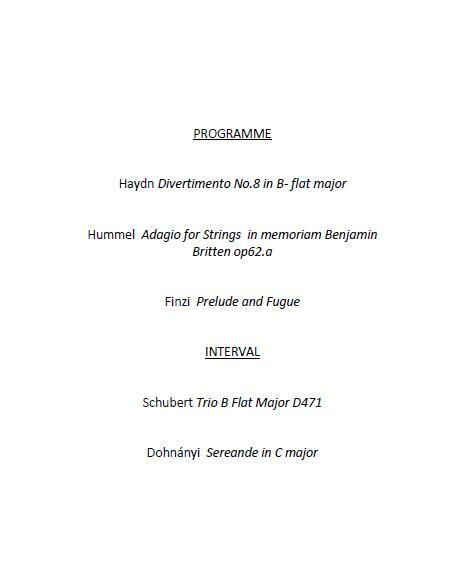 Wednesday 16th September 2015 at 7:30pm, Horton Village Hall. 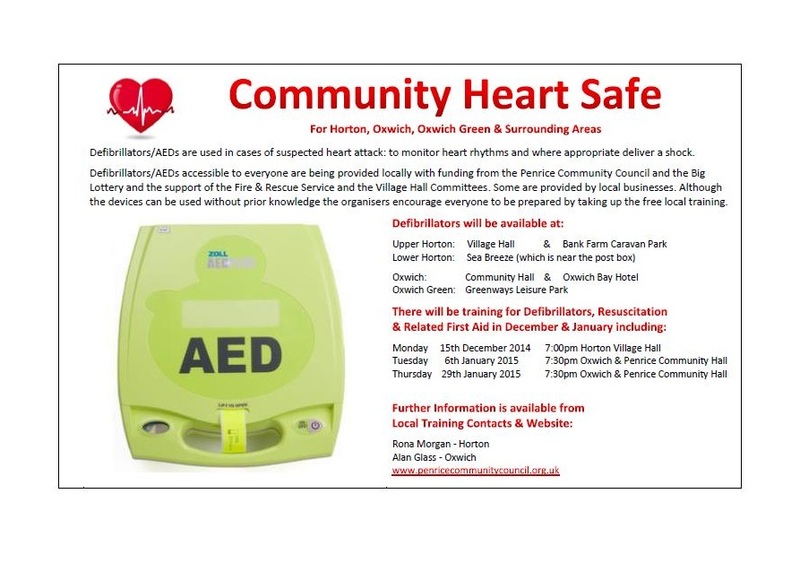 Defibrillators, Resuscitation & Related First Aid Morning training session free of charge to everyone: Thursday 20th August 2015 9:30am at Horton Village Hall. At Gower Showground, Penrice, for benefit of St Andrews Church, Penrice. Sunday 2nd August 2015 between 9.00am and 6.00pm. Oxwich & Penrice Community Hall. Talk on the wildlife of Gower. New enquiries can be made using Contact Us Form Mail Forwarding. Talk on the management of National Trust Gower with focus on current challenges. Horton Village Hall AGM 7:30pm Tuesday 24th February 2015 at the hall. 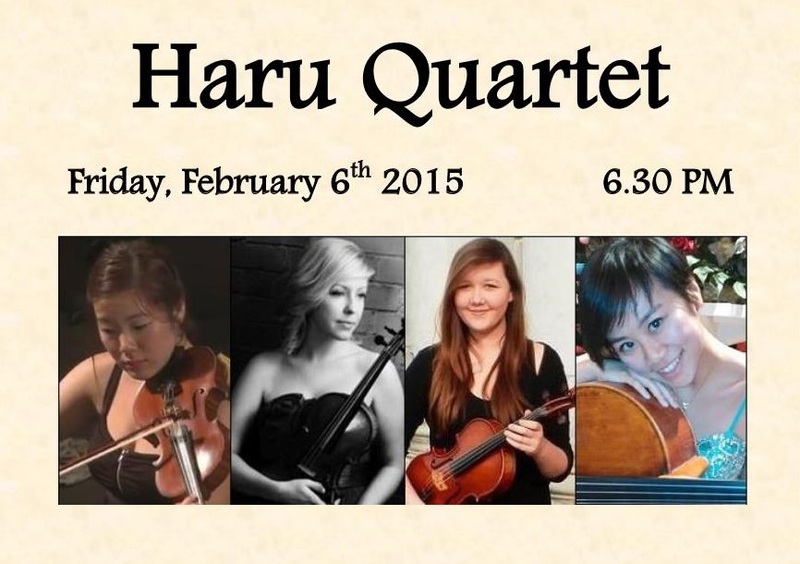 Haru Quartet Poster with concert details. The Horton Gardening Club will meet at Horton Village Hall on the evening of Wednesday 4th February 2015. Randolph will talk about growing vegetables with insight as a grower on Gower for 60 years. Base Station/Mast for Mobile Infrastructure has previously been proposed for location near Horton.